The Conservatives have hailed the European elections as evidence they are making progress across the country. They secured 27.7% of the vote across Britain, up from 26.7% in 2004 and pushed Labour into second place in Wales for the first time since 1918. In Northern Ireland the Ulster Conservatives and Unionists also gained one of the three MEPs up for grabs. 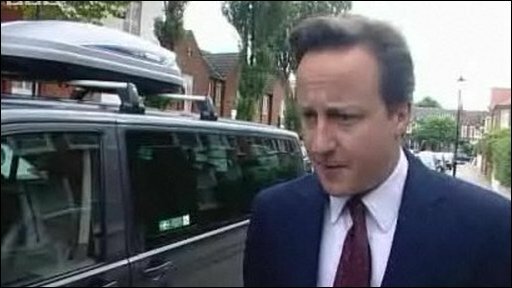 David Cameron said he was "delighted" with the performance and repeated his call for a general election. Shadow foreign secretary William Hague said the party was "advancing" in all areas of the country. The results come on top of a strong showing for the Tories in English council elections on Friday, where it polled 38% of the vote and took control of a host of councils across the south west and the Midlands. The Conservatives said Sunday's results - which saw Labour relegated into third place behind UKIP - showed that Gordon Brown's authority had disappeared completely and he should call an immediate general election. Including the Ulster Conservatives and Unionists' Jim Nicholson the Tories secured 26 seats in the European Parliament - twice as many as Labour's 13. The Tories led the way in every English region except the North East, overtaking Labour in the North West and Yorkshire - areas in which it must gain seats if the party is to win a majority in a future general election. Its share of the vote was broadly unchanged in many regions, although it rose significantly in the East Midlands at the expense of both UKIP and Labour. Although its vote share was not much higher than in 2004, the Tories said the results must be seen in the context of the political climate following the expenses scandal. Leader David Cameron said: "The Conservative Party were the clear winners in these elections. We topped the poll, we increased our share of the vote, increased our number of MEPs, we won in almost every part of the country and had some staggering results like topping the poll in Wales. "The next election should be a general election. And just as Labour has lost the trust of the British people I want the Conservative Party to work hard to win that trust and just as Labour has failed, we have to work hard to show how we can succeed." Shadow foreign secretary William Hague said that, since the introduction of PR for European elections, many voters used the polls to punish the main parties and to "indulge" smaller and fringe parties. "People sell their votes quite cheaply to minority parties," he told the BBC. But he said he was content with the outcome, noting the Tories were "advancing in all parts of the country". Conservative MEP Daniel Hannan said Labour had endured its worst poll performance since it became a national party in the 1920s. "I am not sure people have a complete grasp of the magnitude of what is happening," he told BBC News. The highlight of the evening for the party was its triumph in Wales, where it polled 7,000 more voters than Labour and relegated it into second place for the first time in a national election for about 90 years. Shadow Welsh Secretary Cheryl Gillan said the result was an "historic" triumph. "The Labour Party has taken people in Wales for granted for an awfully long time," she said. "I hope that we can show people in Wales that we really have something to offer." In the run-up to the elections, controversy has surrounded the party's plan to leave the centre-right grouping of parties in Brussels, the European People's Party. The Tories plan to set up a new grouping with like-minded parties opposed to further political integration but critics have said this will leave them isolated.